Analysis Platform for Energy Efficiency Enhancement in Hybrid and Full Electric Vehicles, NICOLAICA, M.-O., TARNICERIU, D.
Maximum Entropy Principle in Image Restoration, PETROVICI, M.-A., DAMIAN, C., COLTUC, D.
Wavelength Converters Placement in Optical Networks Using Bee Colony Optimization, MARKOVIC, G. Z. A New Autofocusing Method Based on Brightness and Contrast for Color Cameras, SELEK, M.
All-Weather Road Image Enhancement using Multicolor Content-Aware Color Constancy, LEE, D., KIM, T., BYUN, H., CHOI, Y.
DALI, M. , GUESSOUM, A. , GIBSON, R. M. , AMIRA, A. , RAMZAN, N.
This article presents and evaluates pipelined architecture designs for an improved high-frequency Fast Fourier Transform (FFT) processor implemented on Field Programmable Gate Arrays (FPGA) for Multiple Input Multiple Output Orthogonal Frequency Division Multiplexing (MIMO-OFDM). The architecture presented is a Mixed-Radix Multipath Delay Commutator. The presented parallel architecture utilizes fewer hardware resources compared to Radix-2 architecture, while maintaining simple control and butterfly structures inherent to Radix-2 implementations. The high-frequency design presented allows enhancing system throughput without requiring additional parallel data paths common in other current approaches, the presented design can process two and four independent data streams in parallel and is suitable for scaling to any power of two FFT size N. FPGA implementation of the architecture demonstrated significant resource efficiency and high-throughput in comparison to relevant current approaches within literature. The proposed architecture designs were realized with Xilinx System Generator (XSG) and evaluated on both Virtex-5 and Virtex-7 FPGA devices. Post place and route results demonstrated maximum frequency values over 400 MHz and 470 MHz for Virtex-5 and Virtex-7 FPGA devices respectively. D. Gesbert, M. Shafi, D. Shiu, P.J. Smith, and A. Naguib, "From theory to practice: an overview of MIMO space-time coded wireless systems," IEEE J. Select. Areas Commun., vol. 21, no. 3, pp. 281-302, Apr 2003. J. A. C. Bingham, "Multicarrier modulation for data transmission: an idea whose time has come," IEEE Communications Magazine, vol. 28, pp. 5-14, May 1990. H. Sampath, S. Talwar, J. Tellado, V. Erceg, A. Paulraj, "A fourth generation MIMO-OFDM: broadband wireless system: Design, performance, and field trial results," Communications Magazine, IEEE, vol. 40, no. 9, pp. 143-149, Sep. 2002. Y. G. Li, J. H. Winters, N. R. Sollenberger, "MIMO-OFDM for wireless communications: Signal detection with enhanced channel estimation," IEEE Trans. Communications, vol. 50, no. 9, pp. 1471-1477, Sep. 2002. H. Y. Chen, J. N. Lin, H. S. Hu, S. J. Jou, "STBC-OFDM downlink baseband receiver for mobile WMAN," IEEE Trans. on Very Large Scale Integration (VLSI) Systems, vol. 21,no. 1, pp. 43-54, Jan 2013. IEEE 802.16 Working Group, "IEEE standard for local and metropolitan area networks. Part 16: Air interface for fixed broadband wireless access systems," IEEE Standard 802.16e-2005, 2006. 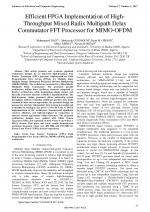 Y. W. Lin, C. Y. Lee, "Design of an FFT/IFFT processor for MIMO OFDM systems," IEEE Trans. on Circuits and Systems I, vol. 54, no. 4, pp. 807-815, Apr. 2007. B. Fu, P. Ampadu, "An area efficient FFT/IFFT processor for MIMO OFDM WLAN 802.11n," Journal of Signal Processing Systems, Springer, vol. 56, no. 1, pp. 59-68, Jul. 2009. K. J. Yang, S. H. Tsai, , G. C. H. Chuang, "MDC FFT/IFFT Processor With Variable Length for MIMO-OFDM Systems," IEEE Trans. on Very Large Scale Integration (VLSI) Systems, vol. 21, no. 4 , pp. 720-731, Apr. 2013. S. N. Tang, C. H. , Liao, T. Y. Chang, "An area- and energy-efficient multimedia FFT processor for WPAN/WLAN/WMAN systems," IEEE J. of Solid-State Circuits, vol. 47, no. 6, pp. 1419-1435, Jun. 2012. S. N. Tang, J. W. Tsai, T. Y. Chang, "A 2.4 GS/s FFT processor for OFDM based WPAN applications," IEEE Trans. on Circuits and Systems II: Express Briefs, vol. 57, no. 6, pp. 451-455, Jun. 2010. C. Wang, Y. Yan, X. Fu, "A High-Throughput Low-Complexity Radix-24-2²-2³ FFT/IFFT Processor With Parallel and Normal Input/Output Order for IEEE 802.11ad Systems," IEEE Trans. on Very Large Scale Integration (VLSI) Systems, vol. 23, no. 11, pp. 2728-2732, Nov. 2015. P. Y. Tsai, C. W. Chen, M. Y. Huang, "Automatic IP generation of FFT/IFFT processors with word-length optimization for MIMO-OFDM systems," EURASIP J. of Advances in Signal Processing, vol. 2011, no. 1, pp. 1-15, Jan. 2011. Y. W. Lin, H. Y. Liu, C. Y. Lee, "A 1-GS/s FFT/IFFT processor for UWB applications," IEEE J. of Solid-State Circuits, 2005, vol. 40, no. 8, pp. 1726-1735, Aug. 2005. Y. T. Lin, P. Y. Tsai, T. D. Chiueh, "Low-power variable-length fast Fourier transform processor," in IEE Proc. Computers and Digital Techniques, vol. 152, no. 4, pp. 499-506, Jul. 2005. S. He, M. Torkelson, "A new approach to pipeline FFT processor," in Proc. International Parallel Processing Symposium (IPPS '96), Washington, DC, Apr. 1996, pp. 766-770. S. He, M. Torkelson, "Designing pipeline FFT processor for OFDM (de)modulation," in Proc. International Signals, Systems, and Electronics Symposium (ISSSE 98), Pisa, Sep. 1998, pp. 257- 262. P. P. Boopal, M. Garrido, O. Gustafsson, "A reconfigurable FFT architecture for variable-length and multi-streaming OFDM standards," in Proc. IEEE International Symposium on Circuits and Systems (ISCAS 2013), Beijing, May 2013, pp. 2066-2070. E. E. Swartzlander, W. K. W. Young, S. J. Joseph, "A radix-4 delay commutator for fast Fourier transform processor implementation," IEEE J. of Solid-State Circuits, vol. 19, no. 5, pp. 702-709, Oct. 1984. M. Ayinala, M. Brown, K. K. Parhi, "Pipelined parallel FFT architectures via folding transformation," IEEE Trans. on Very Large Scale Integration (VLSI) Systems, vol. 20, no. 6, pp. 1068-1081, Jun. 2012. M. Garrido, J. G. Rajal, M. A.. Sánchez, O. Gustafsson, "Pipelined Radix-2k Feedforward FFT Architectures," IEEE Transactions on Very Large Scale Integration (VLSI) Systems, vol. 21, no. 1, pp. 23-32, Jan. 2013. M. Garrido, M. Acevedo, A.. Ehliar, O. Gustafsson, "Challenging the limits of FFT performance on FPGAs," in Proc. IEEE International Symposium on Integrated Circuits (ISIC), Singapore, Dec. 2014, pp. 172-175. Z. Wang, X. Liu, B. He, F. Yu, "A Combined SDC-SDF Architecture for Normal I/O Pipelined Radix-2 FFT," IEEE Trans. on Very Large Scale Integration (VLSI) Systems, vol. 23, no. 5, pp. 793-977, May 2015. S. Uzun, A. Amira, A. Bouridane, "FPGA implementations of fast Fourier transforms for real-time signal and image processing," in IET Proc. in Vision, Image and Signal Processing, vol. 152, no. 3, pp. 283-296, Jun. 2005. Citations for references updated on 2019-04-22 16:10 in 161 seconds. Website conception, design and maintenance by Eugen COCA. Content updated on 28 Feb 2019. Site engine updated on 28 Feb 2019. This page was generated on the server in 0.049 seconds and loaded in your browser in > seconds.